The program covers 70 years of Japanese classical music, beginning with a Piano Sonata by the German-trained Saburo Moroi. Moroi was Japan's first great symphonist and his musical language shows the influence of Hindemith. "Second Generation" composer Toru Takemitsu is arguably Japan's most famous composer. Takemitsu composed music in nearly every style, from experimental electronic pieces to film scores and even lounge jazz songs.His best works are characterized by a successful blending of Japanese aesthetics with western compositional techniques. The music of the Post War generation is represented by works from three of Japan's most popular living composers. Shin-Ichiro Ikebe is best know for his many soundtracks and film scores for the director Akira Kurosawa and the popular Miyazaki anime movies, while composer Akira Nishimura has consciously sought to create a distinctive Pan-Asian musical language, bringing together aspects of the aesthetic, spiritual and philosophic traditions from many different cultures. Keiko Fujiie, the youngest composer represented in this recital is no doubt familiar to guitarists around the world. She has composed many popular works for performance by her husband, the phenomenal guitar virtuoso Kazuhito Yamashita. 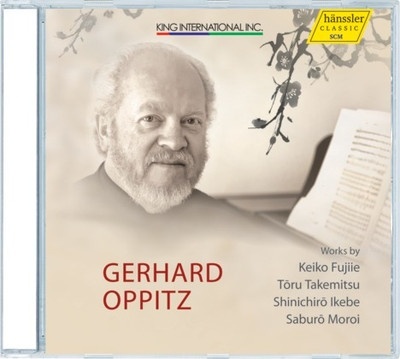 This is an extraordinary recital, beautifully performed by Oppitz and an invaluable documentation of a still-neglected area of the 20th century piano repertoire.